Thin Air Community Radio is a non-profit, non-commercial, FM community radio station that provides a platform for progressive news, views and diverse musical and cultural expression. You won't hear this kind of programming anywhere else. KYRS is heard on 88.1 and 92.3. 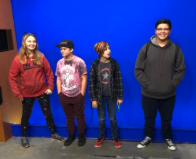 City School has partnered with KYRS to create a “for teens, by teens” radio show at the Main Building in downtown Spokane. Our show airs every Monday at 2:00 pm to 3:00 pm and the name of our show is called Detention. Every week, Tuesday through Friday we prepare our topic for that week, write stories about them and have other talks and discussions for the following Monday. These topics are discussed when students are live on the radio! This job component looks for clean language, hard workers, and commitment,. This is an all year round job.